Am I really late for this Halloween or really early for Halloween 2009? In either case I don't think you are going to regret my timing. 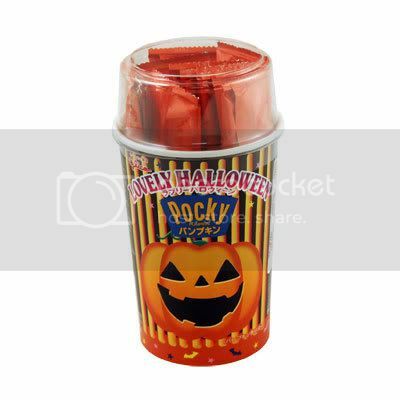 The Halloween Pocky (which comes in a very cute popcorn style container) is supposedly a pumpkin flavored Pocky. I say supposedly because if you made me blind taste it, I would never, ever have guessed that I was supposed to be looking for pumpkin flavor. No my friends what it smells like is vaguely fruity, fake butter. And what it tastes like it salty fake butter. You know how movie theater popcorn can sometimes smell so salty and strong it's almost chemically?- that describes the taste perfectly. Did I miss something? Has anyone had it and they really thought it tasted like pumpkin? Should I be worried that while it never stops being gross the taste does grow on you? It's not pumpkin, it's caramel flavored. Pumpkin indicates halloween that's all.